Tokyo is full of food. Walk down any major street and you’ll be surprised by the sheer amount of restaurants. Even on tiny side streets you come across tiny dedicated storefronts selling roasted sweet potatoes, mochi, or rice rice crackers. Tokyo is a city where you can specialize. 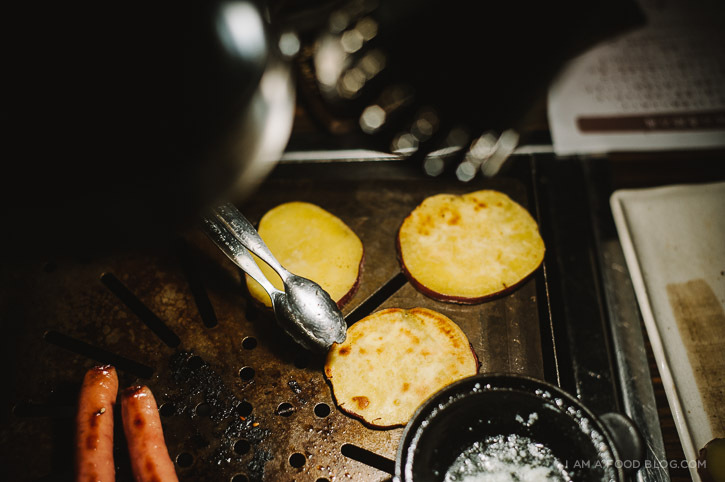 Take the sweet potato store: there might be a bit of variation, say, purple sweet potatoes, or yellow-fleshed sweet potatoes in addition to the traditional satsumaimo. But those are small deviations – the store sells just potatoes. And somehow, in this city of 13 and a half million, they survive. Sometimes they might even have a little line up. To me, that says a lot about Tokyoites, or maybe the Japanese in general. The ability to focus on one thing until perfect is either pure madness or genius. That being said, if you’re looking for your perfect bowl of ramen, piece of onigiri sushi, or slice of beef, Tokyo is the place to find it. Only problem is, if you’re looking for a specific place, it might take a while to find. The first time Mike and I visited Japan, in 2010, we got lost. A lot. (We’ve now figured out the system. Well, Mike’s figured out the system.) Like any good food obsessed person, I had a massive list of places to try. Armed with addresses, maps and storefront photos, we figured navigating the city would be a breeze. It wasn’t. If you’re coming to Tokyo, be prepared to be lost. It’s actually kind of charming if you’re not stressed out about it. We even got lost looking for a restaurant only 5 minutes from our hotel. We were looking for Ushi no Kura, a well regarded yakiniku restaurant specializing in black wagyu. 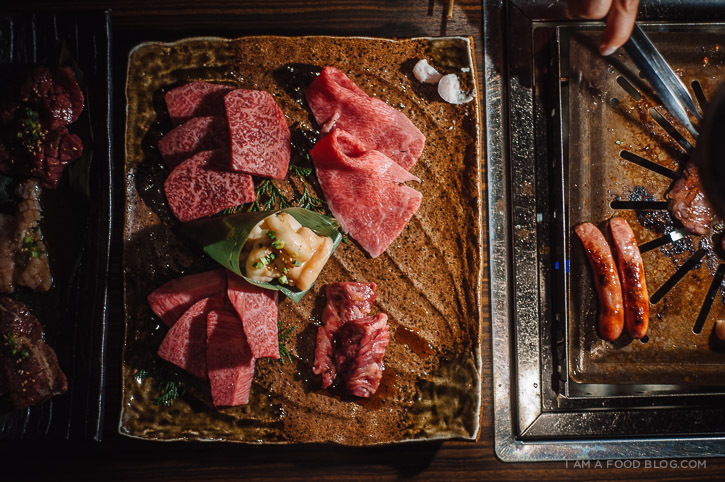 All of their beef comes from the Satsuma region of Kagoshima, on the Southern most island of Kyushu. They’re super proud of their farmers and they should be – the beef is absolutely gorgeous: marbled, tender and full of flavour. 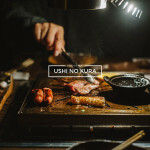 There’s a wide range of yakiniku places in the city, but Ushi no Kura stands out because of its beef and ambience. 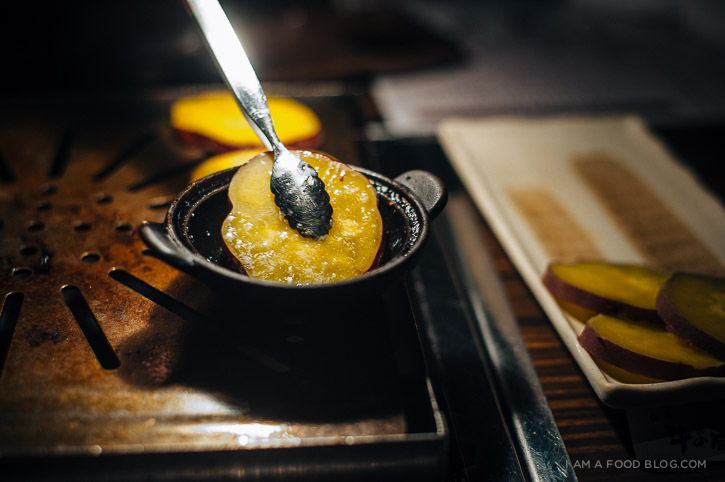 Dark, sleek and private, the booths at Ushi no Kura are cozy and intimate. 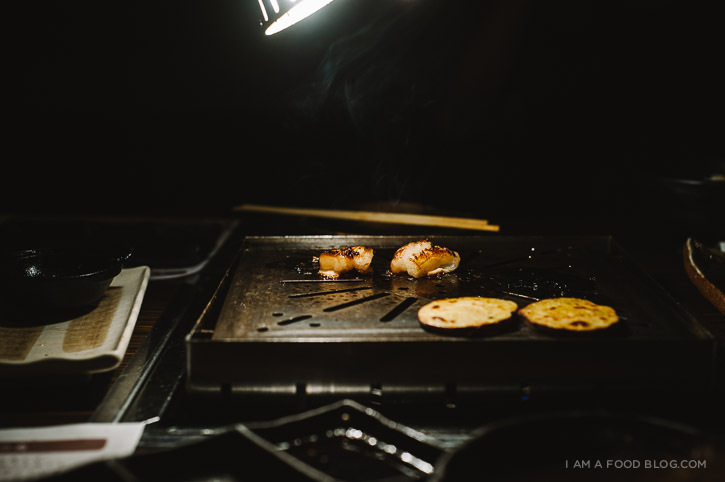 The idea is to grill, chat, drink and eat at your leisure. We like ordering their Satsuma special, which comes with sirloin, kalbi, harami, shabu and horumon. I always order the satsuma imo with butter because grilled sweet potatoes in between bites of beef can’t be beat. If you’ve ever watched Lost in Translation there’s a scene in which Bill Murray and Scarlett Johansen go to a restaurant where they’re presented with a picture menu full of plates of meat. All the meat looks the same, so Bill’s character, Bob, randomly points at one and says, “two of these.” There’s a boiling pot in the middle of the table for them to cook the meat in. They’re at a shabu shabu place. 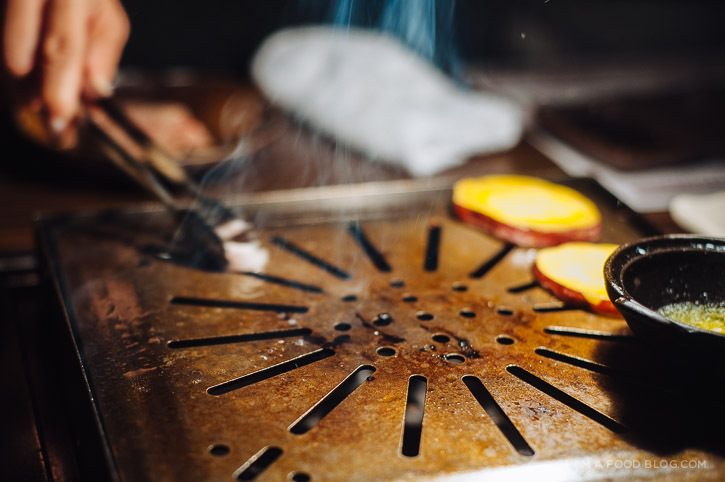 Switch out the pot for a grill and you have yakiniku. It’s after they’ve left the restaurant that Bob remarks, “What kind of restaurant makes you cook your own food?” It’s kind of hilarious, but I actually love restaurants that let you cook your own food. 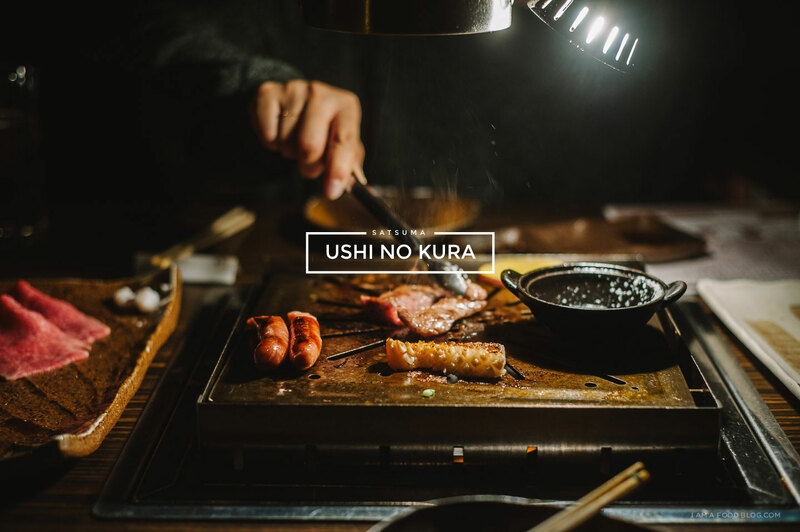 So, if you too love going to restaurants that let you cook your own food, visit Ushi no Kura. You won’t be disappointed! 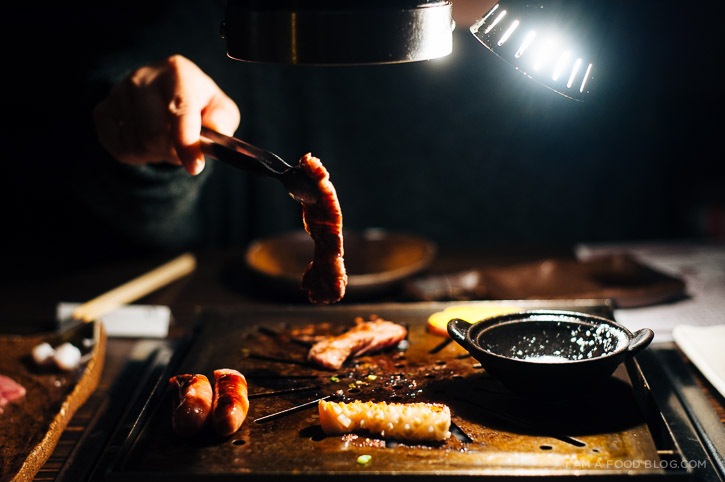 I’ve never seen photos this good of yakiniku! You did an amazing job. I always get steam or smoke everywhere I don’t want, and the lighting is super tricky! I’m obviously a point-and-shoot amateur, but I’ve seen plenty of pro pictures that still don’t capture it as well. Fantastic job, I’m now craving it. I’m headed to Japan this spring, and I plan on getting lost a lot. To me, that’s part of the fun of a new place. I love the photos, too … you’re really making me want to visit Japan! Oh. Wow…. Your photographs are absolutely stunning… My husband and I are planning a trip for next year to Japan, absolutely adding this to the list. 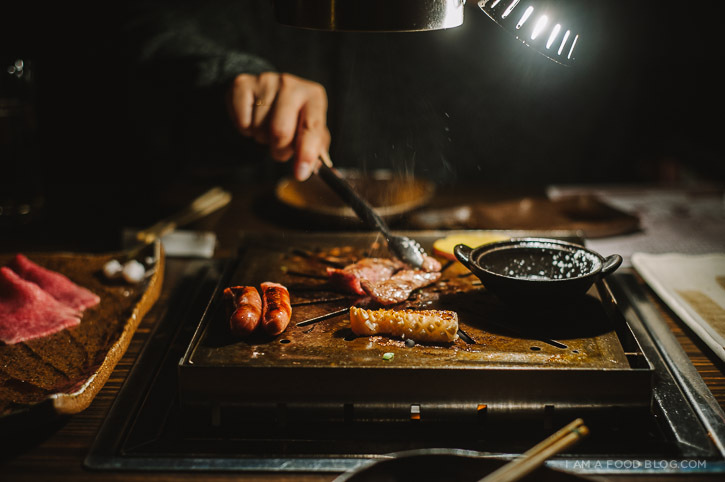 I’m flyinng to Tokyo in a few months and, being a food lover, I have a list of my own. However, I am still wondering: if you still have it – may I get your list, too, please? These shots are such an inspiration. Excellent work. This place looks great – I was in Tokyo over Christmas and if I went there only for the food, I would leave a happy, happy man. We went to a yakiniku place called Yoroniku and the concept was the same. Amazing beef… so tender… oh god I’m drooling.